Ginger Meggs, Australia's most popular and longest-running comic strip, was created in the early 1920s by Jimmy Bancks. The strip follows the escapades of a red-haired prepubescent mischief-maker who lives in an inner suburban working-class household. While employed at The Bulletin, Bancks submitted cartoons to the Sydney Sunday Sun, where he began his Us Fellers strip in 1921 in the "Sunbeams" section of the Sunday Sun. Ginger first appeared in Us Fellers on 13 November 1921, drawn by Bancks. When Bancks died on 1 July 1952 from a heart attack, Ron Vivian took over the strip (1953-1973), followed by Lloyd Piper (1973-1982), James Kemsley (1983-2007) and since 2007, Jason Chatfield. Bancks created, wrote, drew and syndicated Ginger Meggs from 1921 until 1952, when he died unexpectedly of a heart attack. The character was based on Bancks's best friend, Charlie Somerville. The latter was a resident of the Sydney suburb of Hornsby, who went on to become a businessman and councillor. After Bancks's death, there was a year's worth of strips to run while another artist was found. Ron Vivian wrote and drew Ginger Meggs from 1953 until 1973. Lloyd Piper wrote and drew Ginger Meggs from 1973 until 1983, when he died in a car accident. James Kemsley wrote, drew and syndicated Ginger Meggs from 1984-2007. On 3 December 2007, Kemsley died at his home in Welby, New South Wales. In the 2008 Queen's Birthday Honour lists, the Australian Government posthumously recognised Kemsley for his efforts with the Medal of the Order of Australia. Jason Chatfield has written and drawn Ginger Meggs since 2007. The strip remains the most widely syndicated Australian comic strip today, appearing in over 120 newspapers in 34 countries. In 1997, a park in Valley Road, Hornsby, was officially named Ginger Meggs Park. Bancks had spent much time in the area during his childhood. In 1985, a postage stamp honouring Ginger or his creator was issued by Australia Post as part of a set of five commemorating children's books. On 1 July 2011, the Perth Mint, released a commemorative 1oz Silver Australian $1 coin to celebrate the 90th anniversary of Ginger Meggs. The coin features an homage to James C. Bancks' 1945 Sunbeams Annual (Series 22) cover, which featured Ginger Meggs on the back of a kangaroo with his dog, Mike and his pet monkey, Tony. The obverse portrays the Ian Rank-Broadley effigy of Her Majesty Queen Elizabeth II, the 2011 year-date and is issued as legal tender under the Australian Currency Act 1965. The coin was designed by current Ginger Meggs cartoonist, Jason Chatfield. Jason Chatfield is Australia’s most widely syndicated cartoonist. 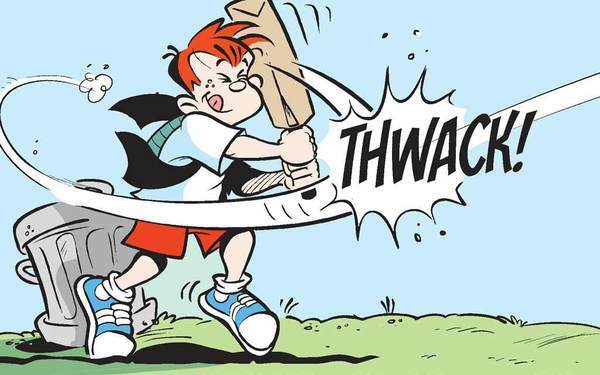 As the fifth cartoonist to write and draw the iconic Australian comic strip Ginger Meggs since its creation in 1921, his work has been exhibited in the USA, France, UK and Australia. He is Vice President of the National Cartoonists’ Society and past President of the Australian Cartoonists’ Association. Jason works out of his studio in New York, and works nights as a stand-up comic. He really likes pizza. A lot.